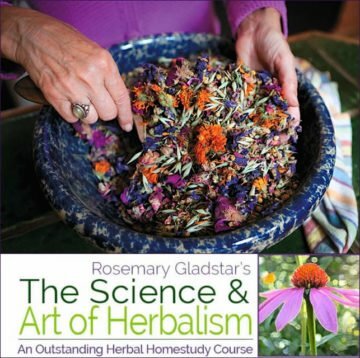 Join Rosemary Gladstar at her home for an introduction to medicinal herbalism. 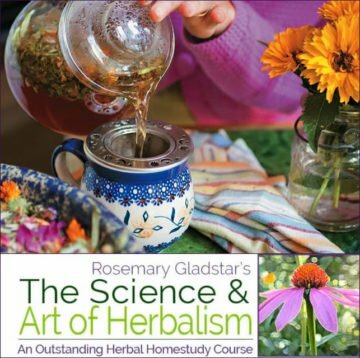 Covering some of the important topics for beginners, Rosemary will guide you through the maze of information on selecting your materia medica, safety issues, formulation, herbal resources, herbs for stress and anxiety and herbs for digestion. Sprinkled along the way are practical advice, delightful information, and the priceless stories that Rosemary so artfully weaves into her teaching. Join Rosemary in her kitchen on Sage Mountain as she discusses medicinal plants and our relationship to them. In this three part introduction, Rosemary covers herbal resources, safety issues, herb quality, and deepening our relationship to plants. Learning to combine herbs together into effective medicinal formulas is often challenging and, perhaps, one of the harder things to teach individuals. One must not only know the properties of the individual herbs, but also have some understanding of the synergistic action between plants. Rosemary uses a simplified version of the Le Sassier Triangulation method of formulating to teach students how to effectively blend herbs. She’ll guide you step by step through the process and work with you through several exercises that will help you discover how simple, fun, and easy it is to make effective blends for specific needs. Module 3) Are Herbs Really Safe to Use? In this informative video, Rosemary discusses the questions everyone asks about herb safety. Are herbs really safe? Can I combined them with other medications? How do I know what information to trust? Are there resources I can use? These questions and others will be discussed. When was the last time you felt truly comfortable in your body, relaxed and stress free? Or that you came to the end of the day and felt you had accomplished everything on your list? When was the last time you woke up and smiled at the day and the day smiled back? Stress and anxiety are major factors of life these days and are the root of a host of physical and emotional problems people face today. It impacts our lives in far more ways than we even know. In this video, Rosemary discusses herbs and natural therapies that address stress, anxiety and depression and help us to achieve a more balanced and peaceful life. Adaptogens and tonics are among some of our most important herbs. These herbs address foundational wellness, tone and strengthen our systems, and help us adapt to the stresses of modern day life. Rosemary will share her favorite adaptogens and tonics from around the world, including ones found in our own back yards. Discussion will include how to use them and how to incorporate them into our daily lives. We can buy the most nutritious food and cook the best meals, but if our gut health is comprised and our digestion is poor, most of what we eat won’t be assimilated. Digestion ~ and liver health because it plays such a key role in digestion ~ is a key factor in health, well being, and healing. Learn the important role that herbs play in digestion and liver health. We’ll discuss digestive bitters, carminatives and mucilaginous herbs that all have an important role in digestion. Many of these herbs can be found growing in our backyards and have been used by our ancestors for centuries. What a fantastic series! I learned so much from this. I am at the very beginning of my journey into herbalism and boy did I pick the right place to start! I am excited to continue learning with Rosemary. I plan on taking the full course. We are so very excited and honored to be a part of your herbal journey as well. Please let us know if you need anything or would just like to share an herbal story!